Four strategies for selecting the right metrics and measures to clearly demonstrate your value. Three strategies to ensure that the qualitative aspects of your contributions are recognized. Two structural and organizational approaches for increasing your profile and strategic focus. Four all-too-common pitfalls and costly mistakes you should work to sidestep along the way. This guide is just one of hundreds of educational resources you get access to as a SellingBrew Playbook subscriber. There's a big difference between just "trying to improve" in a general sense and using a fact-based method for driving systemic improvement. 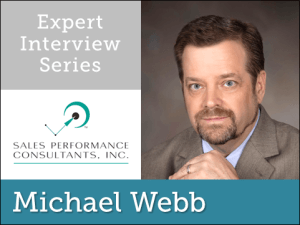 In this expert interview, Michael Webb discusses applying the time-tested principles of process improvement to B2B sales. This interview with Nelson Hyde teaches you about four types of buyers --- how to identify them and how to deal with them. While customer acquisition is certainly important, it might not the best place to focus if you really want to see dramatic improvements in sales performance. Learn how a shift in focus can increase your close-rates, shorten sales-cycles, and improve your margins.